On our way home from Havelock North last weekend we passed the Westpac Stadium and I remarked to our driver, C, that we were hoping to go see a rugby match sometime soon. 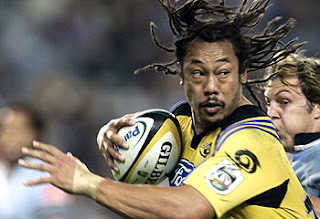 It was a timely comment as C informed us that next weekend was the local teams, the Hurricanes, last Super 14's home game, adding it was to be a memorable occasion as four players were retiring after the match including the legendary Tana Umaga pictured below. Take a good look at the pic above, does he seem familiar? Answer to follow! We decided that we had better go and booked three tickets as Sharon's sister Annette would be here also. The Hurricanes were due to play an Australian team, the Waratahs, from New South Wales. We arrived at the stadium at 7.15pm, the match due to start at 7.35 and took in the great atmosphere. We really enjoyed the build up and the excitement was palpable even though the Hurricanes form to date had been poor. Here's a few pics as the teams arrived out on the pitch. The score at half time could have been a bit one sided was it not for a late Hurricanes try and conversion, bringing the scores at half time to 7-13 in the Waratah's favour. Here's some pics we took at half time. Did I mention it was cold! At half time they gave away a car. Five season ticket holders are each given a car key and, live on NZ television, they each try their key in the car. If they manage to open the door they have won, I'm sure you get the idea. The first three were unsuccessful and handed back their keys to the MC. As the fourth contestant went up, the MC explained that if the fourth person was unsuccessful it meant the fifth person had won the car. The fourth man was unsuccessful and it has to be said that a very reserved fifth contestant went up to open the car. And wouldn't you know it the door wouldn't open, and all this on live TV. Not only that but the other contestants had handed back their keys to the MC!!!!!!!! Cue commercial break. After the brake the MC informed us that each contestant had chosen another key and they began again, the first contestant winning the car on the second time of asking. Bizarre, but very entertaining. Spare a thought for the loser's who, for all they know, could have had the winning key the first time but didn't manage to open the door!!!!!! Here's some more pics of the second half. Figured out who Tana Umaga is yet? Here's another clue! 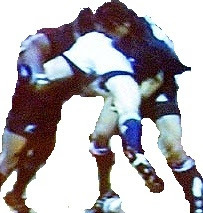 Yes that's right, that's Brian O'Driscoll's backside in the middle and Tana is one of the guys who controversially spear tackled him during the Lion's tour! The match ended at about 9 o'clock and as we headed out of the stadium. There were approx. ten buses waiting to bring people back into town. We got off at Courtney Place and headed to the Malt House to meet up with Roy, a friend of ours from Ireland, who was passing through. That's it for now, we are busy packing today for our trip to the south island. What follows is a map of the south island and you can see in the top right hand corner some blue dots marking the location's of where we have been so far. I can imagine it won't be the only thing that's blue by the time we get back!